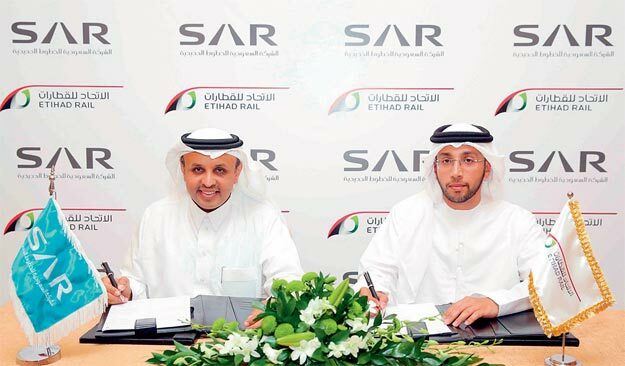 Etihad Rail, the developer and operator of the UAE’s national railway network — signed a memorandum of understanding with Saudi Railway Company, or SAR, that will enhance collaboration and coordination for the rail industry among GCC members. Signed by Eng Faris Saif Al Mazrouei, acting CEO of Etihad Rail, and SAR CEO Dr Rumaih bin Muhammad Al Rumaih, the MoU seeks to introduce common solutions, leverage best practice and allow for the free exchange of ideas and knowledge to improve the safety, efficiency, and economy of both countries’ railways networks. The agreement will serve as a partnership between both parties and will enhance the relationship and long-term collaboration that will ultimately promote and lead to the successful economic development of the railway industry in the UAE and Saudi Arabia. Committees including representatives from both parties will be created and collaborative meetings, seminars, and workshops will be held on a regular basis. He also said that “SAR had built, through the last eight years, an extensive experience in both railway projects and operations that our partners across the GCC can benefit from. Etihad Rail works closely with key stakeholders throughout the UAE as well as the GCC members through the GCC Secretariat-General with shared goals, aspirations, and business objectives to deliver the railway professionally, efficiently and on schedule.